This is a new replacement rubber bump stop kit for use on 1967 - 1969 Camaro and Firebird. This is a 16 pc kit. When installing new replacement weather stripping, replacing the bump stops is also needed. These are simple to install and provide the factory gapping which will prevent premature aging of new weather seals. 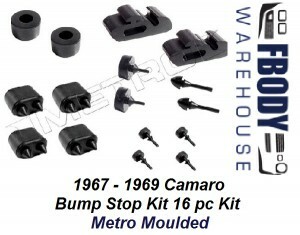 This is a new replacement rubber bump stop kit for use on 1967 - 1969 Camaro and Firebird. This is a 16 pc kit.